Spa getaways offer a relaxing way for couples to re-connect, go on a honeymoon or celebrate an anniversary. Spas in the U.S. and around the world offer unique services and treatments designed especially for the romantic couple. Understanding that peoples' tastes vary, this list covers a diverse range of romantic ideas. You can take art classes from local artists, plan a trip to a scenic island destination, or visit a city spa offering innovative services. Several properties that made our list let you combine relaxing visits to the spa with sunbathing on the beach. 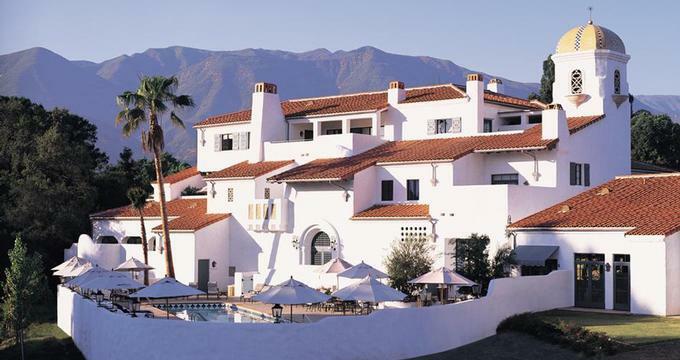 At the Ojai Valley Inn, couples have a unique opportunity to develop inner creativity, enjoy many different activities and sample treatments at the spa. Book one of the Spa Penthouses on the top floor of Spa Ojai and enjoy 1,500 square feet of living space, a fireplace, balcony and easy access to the spa below. The 31,000 square-foot Spa Ojai is one of the top wellness centers in the world, offering two pools, a Moroccan fountain and a signature 50-foot bell tower. Guests have access to a diverse choice of fitness classes, golf, tennis and other sports. The Artist Cottage & Apothecary offers art classes taught by local artists, including painting, precious metal jewelry making and silk scarf painting. Sign up for the custom blending class at the Apothecary and discover your own personal scent - you can even order a customized product line. Dining at the Ojai Valley Inn is a treat for the senses. The restaurants and cafes at the resort village have beautiful outdoor terraces where you will get a chance to sample healthy farm-to-table cuisine featuring dishes which incorporate ingredients from the resort's own herb garden. Cafe Verde serves Asian-inspired spa cuisine indoors, on the terrace and by the pool. Herb Garden Bistro serves sandwiches, burgers and wraps at the Herb Garden pool. The Oak, open for breakfast, lunch and dinner, serves farm-fresh dishes. Jimmy's pub is the place for delicious cocktails and casual dining. If you are in a hurry to get to the golf course or the beach, Joe 'n Go offers a quick take-out menu. Rooms start at $339 per night (855-697-8780). Bhutan is a scenic Himalayan country which remains hidden and undiscovered to most of the world. Uma by Como is located in the northern valley of Punakha in Bhutan, perfect for exploring the culture and myths of this ancient land. You will be surrounded by green valleys, paddy fields, ancient monasteries and the towering snow-capped peaks of the Himalayas. 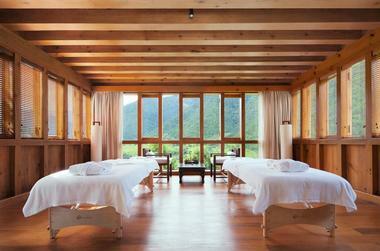 COMO Shambhala Retreat is a beautiful getaway offering Asian-inspired treatments in a spiritual setting. 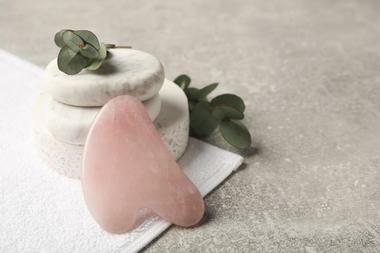 Choose from body therapies, facials, signature massages and traditional stone therapies. The couples suite is perfect for a day of pampering with your loved one. The property offers nine rooms as well as one and two bedroom villas with tunning views of the valley. You can see the sweeping countryside and the meandering Mo Chu river from your private terrace. Bright wall paintings from local artisans and sheesham-wood furniture adorn the guest accommodations. One bedroom villas come with terraces, a separate dressing area and a cozy bedroom. You will love the traditional Bhutanese designs in the two-bedroom villas which have a dining area with panoramic views. Outside you will find hydrangeas, camellias, azaleas and rhododendrons. Bukhari is the premium restaurant, serving traditional Bhutanese flavors and international delicacies. Bukhari is one of the finest restaurant in Bhutan and uses locally sourced produce in its dishes. Bukhari open-plan lounge and bar is chic and elegant, offering delicious cocktails and mock tails along with the finest beers and wines. Rates start at $550 for a Valley View Guestroom and from $750 for a One Bedroom Villa (+975 8 271597). Carillon Miami Beach is a unique getaway, featuring a great spa, elegant accommodations, gourmet dining, a range of activities and packages. The 70,000-square-foot Wellness Center is the largest in Florida. Sign up for fitness classes, swim laps in the pool, conquer the two-story climbing wall, and attend wellness classes. Beautiful suites range in size from 720 to 1,200 square feet. Enjoy private terraces with ocean views, HDTV system with integrated Internet access and fully-equipped kitchens. If you have any romantic requests, remember to ask when planning your trip. There are several dining options to choose from. You may also like: 20 Best Things To Do in Miami This Weekend. 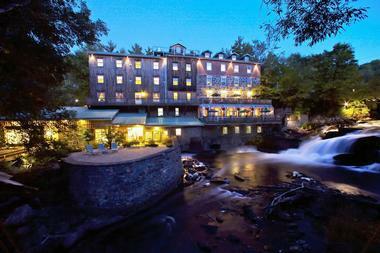 Get a massage with a view of a 28-foot waterfall at The Wakefield Mill Hotel & Spa near Ottawa, Canada. The spa offers a diverse menu of relaxing treatments, outdoor hot tubs and a lounge with complimentary snacks. Book a couples' massage, pedicure or a 4-hour romantic spa package with dinner. Guests are accommodated in the historic Main Mill building or in the LEED-certified Eco River Lodge which has a honey bee apiary on its roof. The honey produced by the apiary is used in the hotel kitchen. For a unique experience, ask for one of the suites in the original grain silos or a River Grand room with a Jacuzzi, fireplace and river views. Muse restaurant offers fine dining overlooking the falls, complete with a diverse selection of boutique wine, and dishes prepared with local ingredients. In the morning, choose from buffet or a la carte breakfast. On weekends, there is live music from 7pm to 10pm. Activities include cross-country skiing, hiking, yoga and meditation gardens. Explore the beautiful Gatineau Park with its lakes, forest and rivers. The town of Wakefield is home to charming shops, cafes and restaurants. Rooms start at CAD 220 per night. Having access to a white sandy beach in the Caribbean can only help your sense of wellbeing and relaxation. 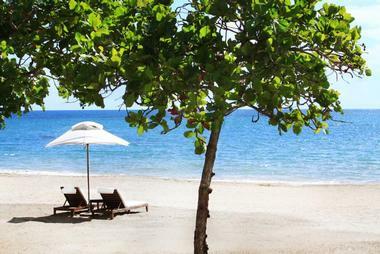 Visit the scenic island of St Lucia and stay at Sugar Beach, a Viceroy Resort. The unique rainforest retreat will make you feel like you've gone back in time and ended up in an ancient village. Treatment rooms are surrounded by lush tropical plants. The couples suites are spacious - a couple of different layouts are available, so be sure to let the hotel know your preferences. 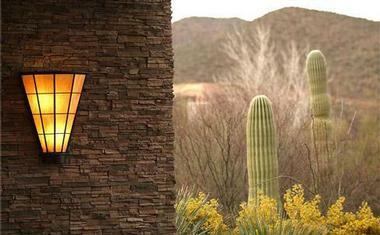 The wellness center at Arizona Biltmore utilizes organic ingredients in its treatments. Couples can get a side-by-side Couples Massage which uses a specially created aromatherapy blend of essential oils to release stress and relax the senses. If you visit from October through April, the couples massage is performed in the outdoor massage cabanas. 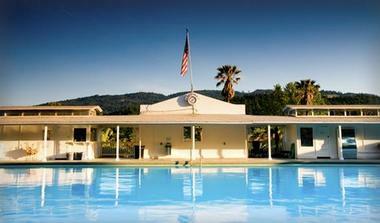 When you are touring Napa Valley, stop at Indian Springs in Calistoga which specializes in mud bath treatment services. Immerse yourself in warm black mud, produced by mixing 100% hand-sifted Indian Springs volcanic ash with hot mineral water. The mud bath soothes muscle aches, increases blood circulation and exfoliates the skin. Before and after your treatment, relax next to the Olympic-size mineral pool, open from spring through fall. In addition to the mud treatment, Indian Springs offers an array of massage services, including basic Swedish massage, deep tissue, Acupressure and pregnancy massage. And best of all, you can combine a relaxing mud bath with a massage during your visit. The Lodge has been completely renovated, offering 24 guest rooms with private patios. Rates start at $185 per night (707-942-4913). Alternatively, book the Couple's Suite at Hotel Healdsburg in California's wine country which has its own private garden, spacious soaking tub for two, and two side-by-side massage tables where you can get pampered in style. Floor-to-ceiling plantation shutters can be closed during the treatment and opened again so that you can walk into the private garden. Check into the all-suite Algodon Mansion in Buenos Aires, Argentina where you can get pampered at Le Spa and relax next to the rooftop pool. Couples have access to the steam room, sauna and treatments from Stendhal Paris, based on Swiss and French techniques. After a visit to the spa, head to the open-air lounge by the pool to sip drinks and relax. The suites at Algodon Mansion feature luxury amenities such as fireplaces, lavish bathrooms and wet bars. They are decorated with original works of art, Italian Calacatta marble and French Limestone. The Pillow menu lets you select the perfect pillow to get a good night's sleep. Algodon Royale Suites are the largest, offering 1,200 square feet of living space, a robe menu and late check-out. Have a romantic dinner at Algodon Club & Wine Bar which offers an extensive collection of Argentinean wines. Aromatherapy is healing for the body and mind. 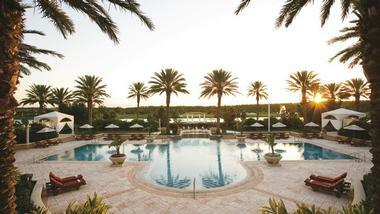 The Fairmont Southampton, Bermuda offers couples soothing treatment options in a relaxed island setting. If you live on the East Coast, you can travel here for a long weekend of pampering and relaxation. Ideal for couples and honeymooners, Casa Colonial Beach & Spa in the Dominican Republic sits on a sandy bay overlooking the clear blue waters of the Caribbean Sea. The design of the property combines old-world elegance and contemporary style to offer guests stylish suites and a Feng Shui-inspired spa. >Book a massage in one of the outdoor treatment gazebos surrounded by a tropical pond and waterfalls for a unique experience. Or if you prefer, the 12,400 square foot spa also has 10 indoor treatment rooms, including two couples rooms with a large Jacuzzis and terrace facing the ocean. Honeymooners can book a side-by-side massage, detoxing wrap, aromatherapy and facials. The most relaxing spot in the house is next to the signature infinity rooftop pool which overlooks the sea from its elevated location. For best views, book a table at Lucia, the hotel restaurant which overlooks the mangrove lagoon and offers gourmet dishes coupled with an extensive wine list. If you want to experience something unique on your honeymoon, be sure to ask. The hotel can arrange a rose petal bath or a romantic dinner on the beach with candles. There are many activities to try in the Dominican Republic, ranging from scuba diving to cultural tours and golf. The hotel concierge is available 24 hours a day to assist you. VacationIdea.com Tip: Have a romantic lunch on the beach on your honeymoon, or head to the hotel's sister property Gran Ventana to play golf. At the Fairmont Orchid in Hawaii, the couples suite is set on top of a waterfall. You can watch the water cascading under you through the hole in the massage table while you are receiving a treatment. Afterwards, relax in the secluded garden area with a drink. Unwind at the spa and relax in the sun next to one of the four swimming pools at the JW Marriott Starr Pass Resort & Spa in Tucson, Arizona. Other activities you can enjoy include hiking, biking and horseback riding in the 50,000-acre Tucson Mountain Park. The Country Club has 27 holes of Arnold Palmer-designed Sonoran Desert golf and a 20,000 square foot clubhouse with men's and women's locker rooms, a shop and two restaurants with amazing mountain views. The guest rooms all have a private balcony or patio with views of the mountains, the course, swimming pools or city lights. Guests can choose from 15 executive suites, 14 luxury suites featuring separate dining and living room, four 1,500 square-foot hospitality suites, and for the ultimate accommodation, two grand presidential suites complete with a private study, dining room and kitchen. Nearby attractions include the Arizona Sonoran Desert Museum, Old Tucson Studios, Saguaro National Park West, and the Pima Air & Space Museum. Choose from numerous dining options for breakfast, lunch and dinner. The Signature Grill serves meals with a Southwestern flair. After a round, enjoy grilled specialties at the Catalina Steakhouse in the Starr Pass Club. You will find health wraps, salads and juices at Blossom, a good choice for those trying to eat more healthy foods. Other dining options include the Terrace Cafe & Bar, Salud, Primo and Plunge. The property is 13 miles from Tucson International Airport. Take a taxi or rent a car. Rates start at around $129 per night and change dramatically depending on the season. Expect rates to be higher in the winter and spring (888-236-2427). La Residence des Cascades is a luxury spa and golf getaway on Egypt's Red Sea Riviera. The resort has 18 holes of championship golf designed by Gary Player. The thalasso-therapy center was built in cooperation with les Thermes Marins de Saint-Malo in France. The inspiration for the wellness center are the healing waters and sands surrounding Soma Bay, renowned for their richness and natural healing power. 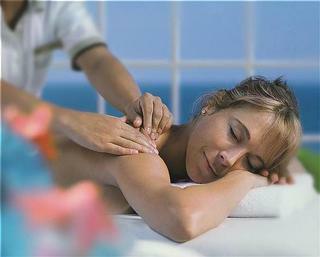 Treatments include a large Tonic Pool, salt water pool, and a variety of massages and hydrotherapies. Enjoy healing therapies inspired by the sea such as seaweed wraps and underwater massages. The Aquatonic Pool is an elaborate water-based seawater facility subdivided into distinct areas, such as baths with jets, walkways, low pressure geysers for feet, seating jets, aqua chairs and many other areas. This pool is for guests over 12 years of age, and children under 16 must be escorted by an adult. There are 210 guest rooms and 39 luxury suites overlooking the golf course and the sea. Rooms have large bathrooms with a bathtub and a separate shower. The private balcony lets you enjoy the view and salty ocean air. Luxury suites have a living area and options to connect with adjacent guest rooms to form a larger space for a family. There are several restaurants, most with outdoor seating and panoramic views. 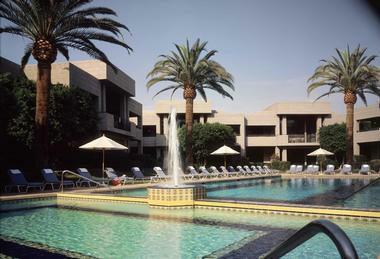 The hotel is located at Soma Bay, 150 miles from Luxor. Fly to Hurghada International Airport in Egypt which is 28 miles from the resort. Mandarin Oriental, Atlanta (formerly The Mansion on Peachtree) is an elegant spa getaway in Atlanta, Georgia. The luxury hotel has 127 guest rooms and 45 spacious residences. The wellness center is an oasis of calm for spa enthusiasts and business travelers alike. Swim laps in the indoor pool, get a soothing massage and unwind in the relaxation area. The outdoor terrace is a great place for relaxing in the sun on a sunny day. The 15,000-square-foot facility has 14 private treatment rooms and two couples suites where you can get side-by-side massages. There is also a Yoga studio, steam, a vitality pool, sauna and a boutique. The 60-foot, climate-controlled indoor lap pool is lit with natural sunlight through large windows. Guest accommodations are decorated in an opulent modern style. Each room as a 37-inch LCD television, deep soaking tub in the bathroom, and panoramic views of Atlanta. Ask for a balcony, especially if you are going on a romantic trip. The Ritz-Carlton Orlando, Grande Lakes is a luxury resort in Orlando, Florida, with a wellness center that measures 40,000 square feet in size and a championship golf course. A popular getaway, the resort offers the Ritz Kids program, children's pool and playground. The resort, adjacent to the 1,000-room JW Marriott, is part of Grande Lakes Orlando. Play golf, visit Orlando's themed attractions, go shopping, take tennis lessons and relax by the pool. There are 584 guestrooms, including 56 Club Level rooms and 66 suites. 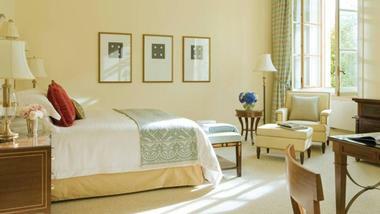 The rooms are spacious, measuring at least 480 square feet in size, and decorated with hand painted Italian furniture. Every room has a private balcony with panoramic views, and marble bathrooms with two sinks, and a separate bathtub and shower. Choose from 9 different restaurants serving New World Cuisine, grilled foods, steaks and healthy cuisine at the Cafe. Book your appointments and golf tee times before you go, especially in high season, to make sure that you get what you want. Doubles, including breakfast, start at $369 per night (407-206-2400). 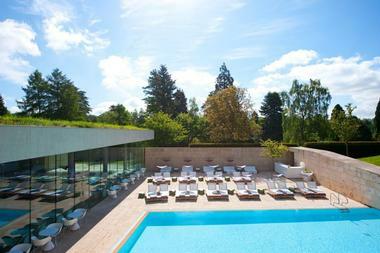 Cowley Manor is a country getaway located in the Cotswolds, one and a half hours from London. Don't let the 1850s exterior fool you - this manor is quite unlike any other traditional country estate. The property has been completely redone in contemporary style. The interior and its 30 guest rooms feature clean-cut, stylish and relaxed decor. The hotel is surrounded by beautiful English countryside, featuring lakes, cascades, ponds and formal gardens. The spa features indoor and outdoor swimming pools, a gym, sauna, steam rooms, and four treatment rooms. If you are planning a family trip, the hotel offers playroom facilities, and nannies by request. The atmosphere in the restaurant is relaxed. The food is perfect for the health-conscious, prepared using fresh seasonal ingredients. Room rates range from GBP 220 to GBP 445 per night, including continental breakfast, service and tax (01242-870-900). Four Seasons Hotel Lion Palace St Petersburg is located in a 19th-century Russian royal palace originally built for Princess Lobanova-Rostovskaya. The property is located near the Winter Palace and Hermitage Museum. There are 177 guest rooms, including 26 suites with scenic city views. Enjoy the impressive four-level luxury spa with six treatment rooms. The couples suite has a private lounge and is ideal for a romantic getaway. The top level has a relaxation pool with natural sunlight through the glass dome. The steamy Russian-style sauna, complete with birch branches to invigorate the skin, is a must-try. The property has two signature restaurants with entrance on St. Isaac's Square. The restaurants are decorated in ornate traditional style with rich woods, marbles and crystal. The Italian restaurant Percorso has an open kitchen and a private dining room for 12 guests. The Asian restaurant Sintoho serves Japanese flavors with northern Asian influence in a contemporary setting (+7 (812) 339 8000). Spa Naka on Naka Island features beautiful design, including an open-air sircular pool surrounded by a stone path that appears to be floating on the surrounding water. 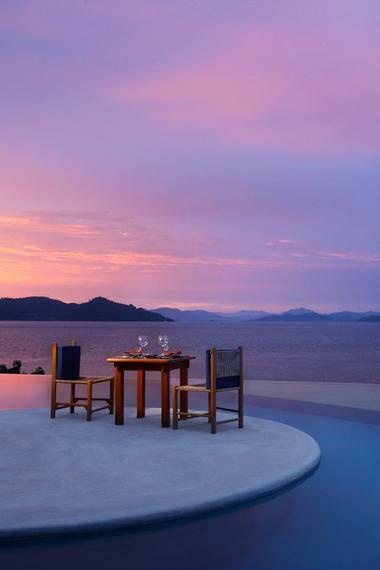 Luxury villas on the island are luxurious and offers awesome views of the water. Isle de France in St. Barts is a romantic hideaway with luxurious accommodations and relaxing facilities. Spend your days relaxing on the beach, get couples treatments, and have romantic dinners on the ocean's edge. Surrounded by natural beauty, your bodies will rejuvenate and re-connect to nature and each other. Look for specials from May to October which is low season in the Caribbean. 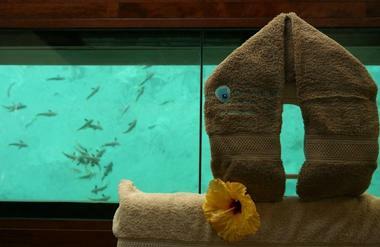 Honeymooners should head to the InterContinental Bora Bora Resort which has one-of-a-kind overwater treatment rooms. 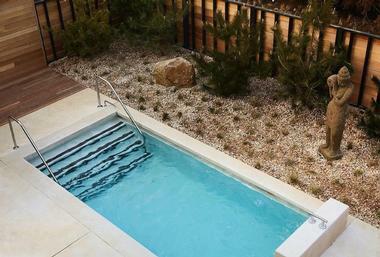 Couples will also have access to the unique hydrotherapy, beauty care and gentle energy areas at the spa. 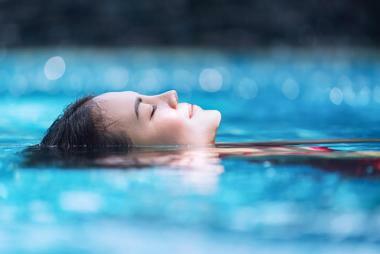 Deep Ocean Spa is the first thalassotherapy center in the South Pacific.